The United States has indirectly informed Iran, via two European nations, that it would not back an Israeli strike against the country's nuclear facilities, as long as Tehran refrains from attacking American interests in the Persian Gulf, Yedioth Ahronoth reported Monday. ED: Er, how about ISRAEL taking things a little more common sense seriously? Perhaps allow investigation of their own nuclear stocks? To stop shrieking endlessly about the horrors of a country it perceives ~ or wants the world to perceive ~ as the horror of horrors. Several of Obama's top advisors believe that Jerusalem is seeking an unequivocal American statement regarding a US strike on Iran ~ should it actively pursue a nuclear bomb. According to the New York Times, Washington has also sent Iran a back-channel deal suggesting they curb their nuclear ambitions, but Tehran rejected the deal, saying no agreement is possible sans lifting all West-imposed sanctions. President Obama had previously rejected the notion, fearing such cyber assaults would wreak havoc on Iranian civilian life. ED: Where to begin? Sanctions are already wreaking havoc on civilian life in Iran. And, have not at least two identified cyber attacks on Iran been recorded so far? And, of course, then there is the MEK to be considered, but that is another story. Later in September, the United States and more than 25 other nations will hold the largest-ever minesweeping exercise in the Persian Gulf, in what military officials say is a demonstration of unity and a defensive step to prevent Iran from attempting to block oil exports through the Strait of Hormuz. 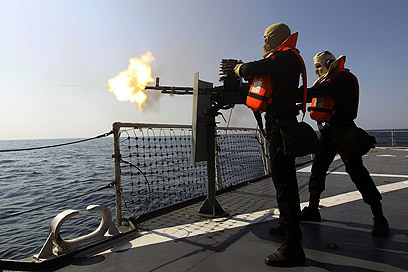 In fact, the United States and Iran have each announced what amounted to dueling defensive exercises to be conducted this fall, each intended to dissuade the other from attack. This is a lot more interesting story than you'd thinkon a first readin. Something big is going on in WDC. Maybe all those calls I've made are finally starting to have their desired effect! LOL!